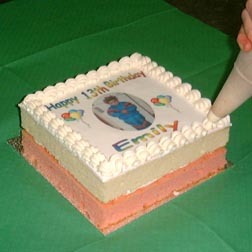 Step 1: Apply a small mist of water to the icing/fondant using a basting brush. 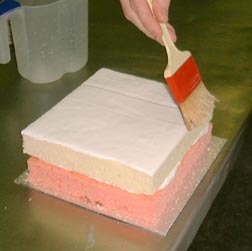 Step 2: Remove the Frosting sheet from the backing sheet & lay on top of the cake, by holding the ends & applying the middle first, & then the ends. Gently pat the Frosting sheet to remove any wrinkles. 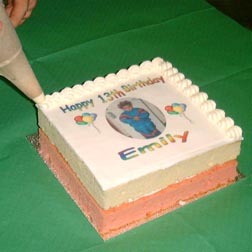 Step 3: Using a sharp blade or scissors, remove any overlapping Frosting sheet. 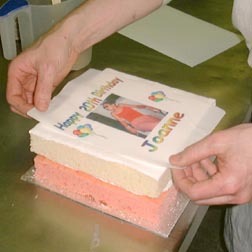 Step 4: The Frosting sheet has now melded to the icing/fondant & will not be seen when the cake is cut. Step 5: Add desired border/decorations. Step 6: Add desired border/decorations. I felt I just had to let you know how pleased I am with your service. 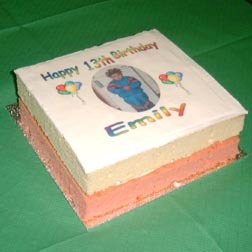 My order arrived within 24 hours of being placed, and I am delighted with the printed cake top. I know my niece's eyes will light up when she sees her finished birthday cake. Thank you very much.